If you know of a volunteer, are a volunteer, or value the commitment made by Rural Fire Brigades; on Tuesday the 16th October 2018 wear a yellow ribbon to show your support. 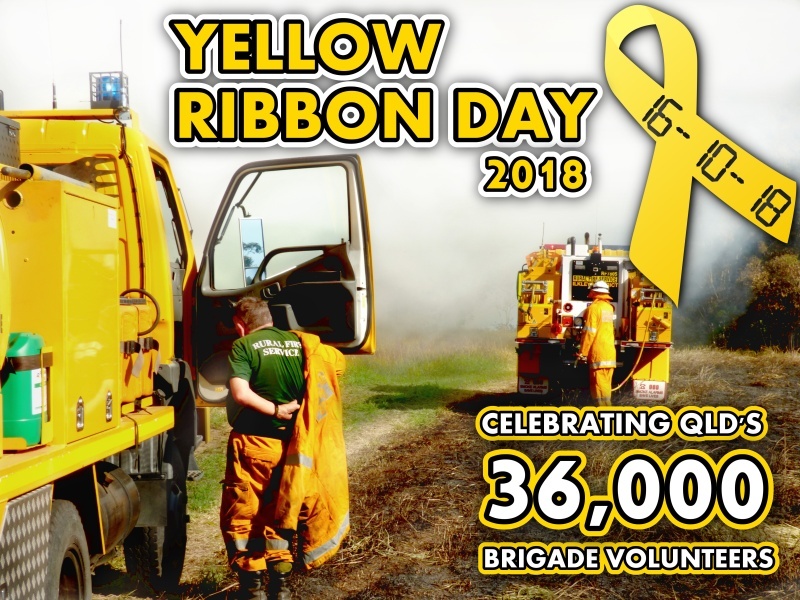 An RFBAQ initiative born out of protest, Yellow Ribbon Day is now an annual event acknowledging the commitment and dedication that 36,000 rural fire brigade volunteers provide to Queensland. Bushfire, Flood or Cyclone - the 1,400+ Rural Fire Brigades across Queensland protect all communities from disaster. Yellow Ribbon Day isn't about making money from selling ribbons - it's about raising awareness. Ribbons can be easily made from materials found online our in some stores. All ribbons provided by the RFBAQ are created by hand by RFBAQ staff! If you have trouble sourcing your own materials and would like some ribbons posted to you, please contact our office. Below are a variety of resources you can use in the lead-up to YRD18 ! Click link / image for downloadable document.